With the majority of my family wanting to eat out in a restaurant on Saturday night, the only way I could persuade them to stay in (and therefore allow me to nicely stay in my points) was to convince them I could cook them a meal as nice as they would have if we went out. Cue me wracking my brain trying to think of easy but impressive restaurant dishes I could make tasty but low in points. This idea popped into my head in the middle of the fish mongers as he told me there were no mussels left (this is usually my ultimate go to low sp starter recipe)! Not only is it exceptionally quick and easy to make but it’s also really low in points. It looks amazing on the plate too. Whilst I would usually think scallops were a bit pricey, I managed to get 12 decent sized scallops in their shells for £10. That’s only £2.50 a head, FAR less than what you would pay in a restaurant. The result was lovely, the flavours work together beautifully and it really does look and feel like something you would order when out. 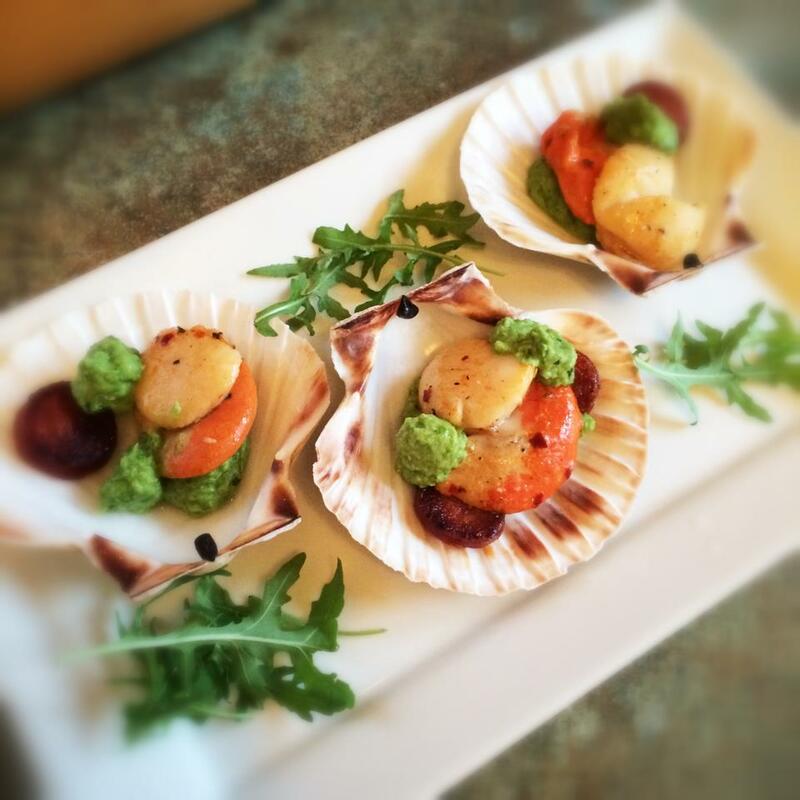 If you want to reduce the price further you could do 2 scallops per person. Pop your peas into some salted boiling water with a few sprigs of mint, cook for 5 minutes, drain and pop back into the pan. Add the butter to the peas and blitz with a hand blender (or food processor) until pureed. Add a little skimmed milk to achieve your desired consistency (I added about 25ml), a little more mint and a good pinch of lemon zest. Taste, season with salt and pepper and add more mint/lemon to your personal taste. Pop to one side. In a large frying pan add the chorizo and fry for a few minutes until the oils release. Remove the chorizo from the pan (leaving the oil behind) and pop to one side on a plate. With the pan still hot, add the scallops and fry for 2 minutes on one side. Turn and fry for 2 minutes on the other side. Remove from the pan. Now you have all your elements ready to plate up. I put my pea puree into a piping bag but if you don’t have one, just use a tea spoon to arrange some little dollops around the plate. Add the chorizo and scallops onto the plate, scatter over the spring onions and finish with some more dollops of pea puree. Add a little rocket to each plate and then pour the remaining oil from the pan over the finished plates and serve each with a slice of lemon. n.b you can also add some crushed chillies to the oil in the pan as the scallops are cooking. This will give the dish just a little kick. This is right up my street! Thank you!